Top five controversies around Leader of the Opposition Jeremy Corbyn’s career, ahead of the British Labour Party primaries on Saturday. London, Sept 22, 2016 (AFP) - Jeremy Corbyn's year in charge of Britain's Labour Party has been marked by a string of controversies ranging from Brexit and the national anthem to a row with billionaire businessman Richard Branson. Here are some of his highest-profile squabbles as Corbyn prepares for an expected triumph at the party's annual conference on Saturday against a leadership challenge backed by rebellious Labour MPs. On September 15, 2015, three days after being elected party chief, Corbyn hit the headlines for refusing to sing the national anthem "God Save the Queen" at a World War II commemoration event. Tabloid newspapers let loose on the new socialist leader. The Sun ran with the headline "Corb snubs Queen", while the Daily Star splashed "Corby a zero: Leftie refuses to sing national anthem" on its front page. Speculation mounted as to whether long-time republican Corbyn would join the Privy Council, an elite group that advises Queen Elizabeth II, and which usually counts the opposition leader as a member. It wasn't until November that it emerged Corbyn had joined the council, but the Guardian reported he had avoided kneeling before the queen while taking the oath, a tradition dating back to Tudor times. 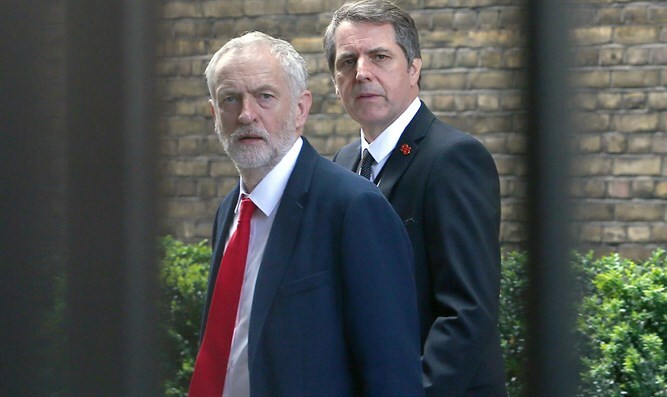 The decision whether to renew Britain's fleet of Trident nuclear submarines soon exposed rifts between Corbyn - a veteran pacifist - and many of his MPs. The party leader insisted he would "never" push the nuclear button if elected prime minister, causing "great concern" to Chief of Defence Staff Nicholas Houghton, who warned such a stance "completely undermined" the point of a nuclear deterrent. Parliament in July overwhelmingly voted to replace the ageing submarines that carry the arsenal, shortly after Prime Minister Theresa May came to power. Corbyn's lacklustre performance in campaigning to keep Britain in the European Union -- the party's official position - raised questions over his true loyalties and broke the uneasy truce between Labour's leadership and its MPs. Many within the party questioned whether their leader, who spoke out against EU free-trade policies for decades, was actually in favour of Brexit and partly blamed him for the fact that 37 percent of Labour supporters voted to leave the union. Former minister Peter Mandelson accused him of "sabotaging" Labour's campaign to stay in the bloc, claims that weren't helped when Corbyn's brother was seen at a pro-Brexit party on the night of the vote. Following the June 23 referendum, parliamentarians immediately launched a no-confidence vote against their leader, which passed with around 80 percent support. A week after the EU referendum, Corbyn invited further criticism by drawing an equivalence between Israel and "so-called Islamic states", interpreted by some as a reference to the Islamic State jihadist group. The Labour leader hoped to quash claims that the party had a problem with anti-Semitism by commissioning an independent report, but caused further upset with the comments made at its launch. "Our Jewish friends are no more responsible for the actions of Israel or the Netanyahu government that our Muslim friends are for so-called Islamic states or organisations," he said. Britain's chief rabbi immediately called the remarks "offensive", while a Jewish Labour MP left the presentation in tears after being singled out for sharp criticism by a guest speaker as Corbyn watched. Last month Corbyn, as a long-time campaigner for railway re-nationalisation, recorded a video sat on the floor of the 11:11 Virgin Trains service from London to Newcastle, claiming there were no seats on the "Ram-packed" carriages. "Passengers across Britain will have been in similar situations on overcrowded, expensive trains," he said, blaming the current system. But the plot thickened when billionaire businessman Richard Branson, owner of Virgin Trains, released CCTV footage apparently showing Corbyn walking past several unoccupied seats before setting up camp on the floor. The Labour leader was initially unavailable for comment, his team revealing he was busy "making jam" at home, but later said he was forced to sit on the floor as he was unable to find two neighbouring seats for him and his wife. Political journalists dubbed it "Traingate".